What is the printing for? It is not visible when the head is attached, it does not seem to resemble anything (like a tie or scarf). 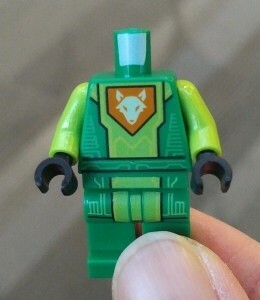 The only thing I can think of is to prevent the head from sticking to the neck peg (or to reduce wear on the plastic itself), but if that's the case, why do some torsos have them and some don't, and why would they be only on the front of the neck peg? While the machines in Denmark use a sensor to detect the paint on the neck-posts to attach the arms correctly, the machines in China use a more sophisticated modern camera to detect torso print, and they don't need the paint on the neck-post. This is why minifigures made in China (collectible minifigures, magnet and keychain minifigs, etc.) do not have the paint mark on the neck. The neck printing is a visual cue for the manufacturing machinery to indicate which side of the minifig is the front. This is done to avoid incorrect assembly of arms, and likely also assists in the printing of the torso. Not the answer you're looking for? Browse other questions tagged minifigures manufacturing or ask your own question. How many minifigs have actually flown in space? How can I fix my chewed up LEGO head? Why don't LEGO Minifigures have ears? Why does Jay have a scar?